Anyone have small groups of guys riding modified imports around their towns. I have been seeing them around lately in Idaho and Oregon. 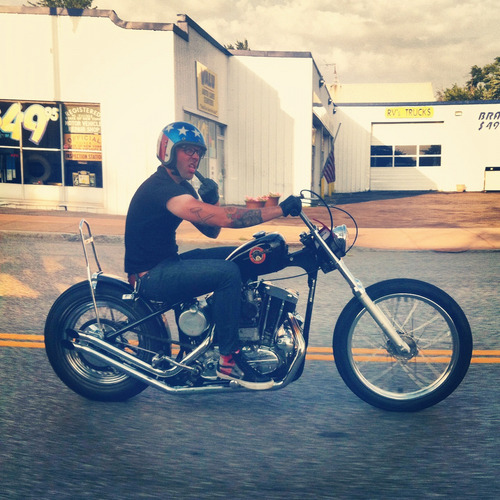 Younger guys, usually on small displacement imports with no front brakes, modded pipes and bad handlebars. Hipsters? Last edited by Jones68; 07-30-2016 at 12:15 PM. I saw a bunch last time I was in NC. A couple were Harleys, but there were also a few parallel twins mixed in. All raked front ends, old flat profile tires, hard tails, etc. No gear minus a 3/4 heltmet and sunglasses. I notice them, but it doesn't bother me. Actually, I like seeing it - 2wheels is better than all of the car groups I was seeing... A Nissan group (all sports cars) was holding me up in the wife's Chevy Traverse! They don't protective gear. Their super tight jeans, no socks and beards will protect them. They are here in Birmingham. They kind of remind me of the café racer scene, except café bikes are infinitely more cool. Ive seen them quite a bit in Bloomington, IN. But usually their bikes are in terrible shape and run like crap. Interesting . I guess they are all across the county. I just didn't know if it was some new "thing" or not. I have only recently seen them. Pfft, braking is for quitters. but yes, doesnt take long to go from hipster to banjo there!